Profoundly influenced by Caravaggio's realism and dramatic lighting, Valentin de Boulogne used light and shadow and a shallow frieze-like arrangement of figures to convey the scene's emotion. Figures fade into the dark background, while faces, hands, and even a knee emerge from the dimness. The figures are highly individualized, especially the old man at the right who holds his glasses firmly to his nose in order to see better and the elderly man with the weathered face and scraggly hair who holds his cape back against his shoulder. For this biblical narrative, Boulogne used contemporary, working-class people as models, a practice initiated by Caravaggio at the turn of the century. Possibly Lorenzo Onofrio Colonna, 1637 - 1689, by inheritance to his son, Filippo II Colonna. Private Collection (Switzerland), sold to P & D Colnaghi & Co. Ltd. (New York), 1983. P & D Colnaghi & Co. Ltd. (New York), sold to the J. Paul Getty Museum, 1983. Longhi, Roberto. "A propros de Valentin." Revue des arts 8, no. 2 (March-April 1958), pp. 62, 65, fig. 4. Cinotti, Mia. Maestri della pittura dal '300 al '700, exh. cat. (Milan: Galleria Levi, 1964), pp. 62-65, no. 23, ill., entry by Mia Cinotti. Klütsch, Margot. "Caravaggio und die französische Malerei des 17. Jahrhunderts." Ph.D. diss. (University of Cologne, 1974), p. 419, no. 21. Brejon de Lavergnée, Arnauld, and Jean-Pierre Cuzin. Valentin et les caravagesques français, exh. cat. (Paris: Réunion des musées nationaux, 1974), p. 252. Cuzin, Jean-Pierre. "Pour Valentin." Revue de l'art, no. 28 (1975), p. 59. Nicolson, Benedict. The International Caravaggesque Movement: Lists of Pictures by Caravaggio and His Followers throughout Europe from 1590 to 1650 (Oxford: Phaidon, 1979), p. 104. Bordeaux, Jean-Luc. "Le Défi Getty." Connaissance des Arts 394 (December 1984), p. 40, ill. "Acquisitions/1983." The J. Paul Getty Museum Journal 12 (1984), pp. 312-13, no. 13, ill.
Rosenberg, Pierre, et al. "France in the Golden Age: A Postscript." The Metropolitan Museum of Art Journal 17 (1982), pp. 44-45, fig. 29. Fredericksen, Burton B. "Recent Acquisitions of Paintings: The J. Paul Getty Museum." Burlington Magazine 127, no. 985 (April 1985), pp. 263, 265, fig. 97. Reinewald, Chris. "Musea en Galeries in Amerika: Het Getty Museum; Een Romeinse villa aan de Pacific Coast." Tableau 9, no. 4 (February 1987), p. 65. Fredericksen, Burton B. Masterpieces of Painting in the J. Paul Getty Museum. Rev. ed. (Malibu: J. Paul Getty Museum, 1988), unpaginated, no. 30, ill.
Mojana, Marina. Valentin de Boulogne (Milan: Eikonos Edizioni, 1989), pp. 22, 72-74, 76, 78, no. 10, ill.
Hall, Nicholas H. J., ed. Colnaghi in America: A Survey to Commemorate the First Decade of Colnaghi New York (New York: Colnaghi, 1992), pp. 58-59, 130, ill.
Cuzin, Jean-Pierre. "Valentin de Boulogne." In The Dictionary of Art. 34 vols. (New York: Grove, 1996), vol. 4, p. 539. Safarik, Eduard A. Collezioni dei dipinti Colonna: Inventari 1611-1795. Anna Cera Sones, ed. (Munich: K.G. Saur, 1996), possibly the work cited on p. 130, no. 245; p. 193, no. 966; p. 274, no. 374; p. 781, no. 25.0374. Jaffé, David. Summary Catalogue of European Paintings in the J. Paul Getty Museum (Los Angeles: J. Paul Getty Museum, 1997), p. 128, ill.
Bajou, Thierry. Paintings at Versailles, XVIIth Century. Elizabeth Wiles-Portier, trans. (Paris: Réunion des musées nationaux, 1998), p. 30. Zuffi, Stefano. Gospel Figures in Art. Thomas Michael Hartmann, trans. (Los Angeles: J. Paul Getty Museum, 2003), p. 199. Hunter-Stiebel, Penelope, ed. The Triumph of French Painting: 17th-Century Masterpieces from the Museums of FRAME, exh. cat. (Portland: Portland Art Museum, 2003), p. 35. Serres, Karen. "L'utilisation du modèle vivant dans la peinture caravagesque à Rome." In Nicolas Tournier et la peinture caravagesque en Italie, en France et en Espagne: Colloque international organisé par le Département d'histoire de l'Art et d'Archéologie de l'Université de Toulouse-Le Mirail 7-9 juin 2001. Pascal-François Bertrand and Stéphanie Trouvé, eds. (Paris: CNRS, 2003), p. 83. Hartje, Nicole. Bartolomeo Manfredi (1582-1622), ein Nachfolger Caravaggios und siene Europäische Wirkung: Monographie und Werkverzeichnis (Weimar: VDG, 2004), pp. 381, 495, no. D1, ill.
Zuccari, Alessandro. I Caravaggeschi: Percorsi e protagonisti. 2 vols. (Milan: Skira, 2010), vol. 1, pp. 734-35, 741, fig. 3. Cuzin, Jean-Pierre. Figures de la réalité: Caravagesques français, Georges de La Tour, les frères Le Nain [...] (Paris: Institut National d'Histoire de l'Art, with Hazan, 2010), pp. 93, 167. Lemoine, Annick, and Keith Christiansen, eds. Valentin de Boulogne: Beyond Caravaggio, exh. cat. (New Haven and London: Yale University Press, with The Metropolitan Museum of Art, 2016), pp. 110, 111, 214; pp. 122-25, no. 16, ill.
Brejon de Lavergnée, Arnout. 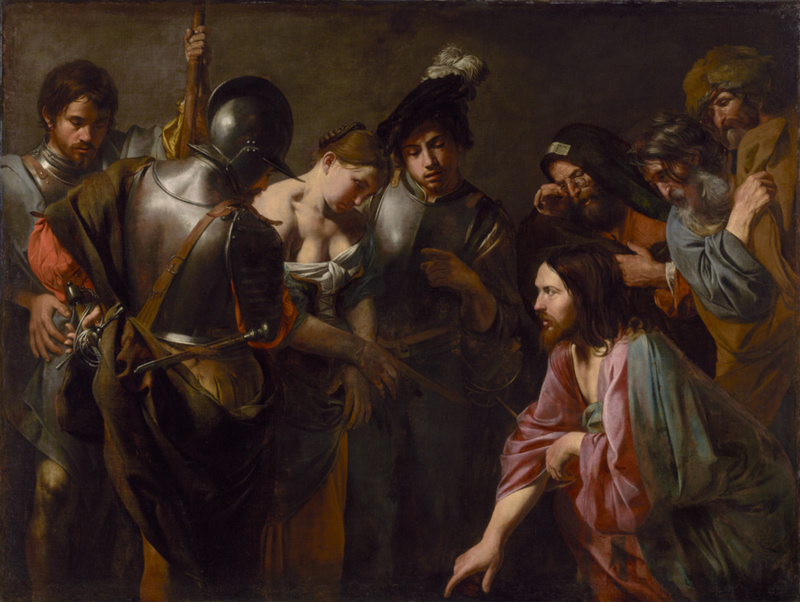 Review of Valentin de Boulogne: Beyond Caravaggio. New York and Paris. Burlington Magazine 159, no. 1373 (August 2017), p. 661.